I’d like to start the week with something simple. 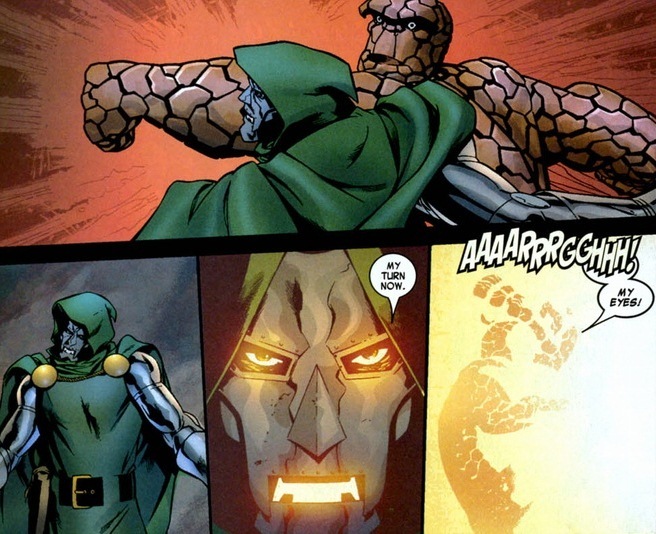 How about the Fantastic Four vs. Dr. Doom? 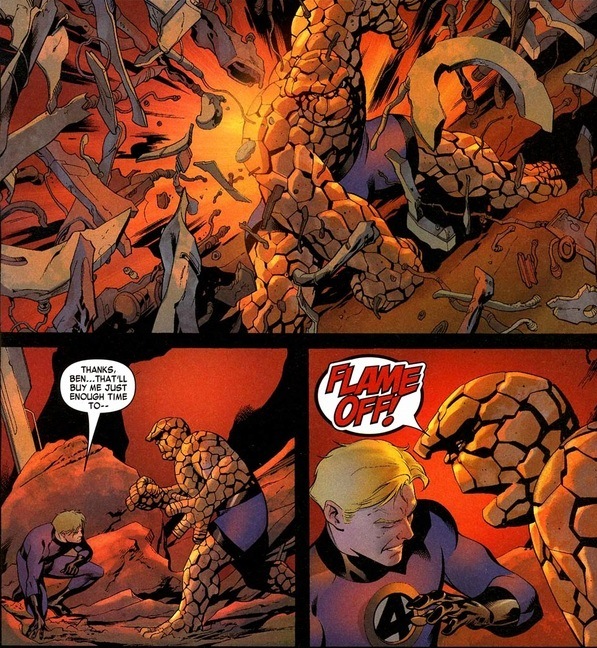 Their rivalry goes back to Fantastic Four #5, volume 1, written by Stan Lee and drawn by Jack Kirby all the way back in 1962. Let’s jump ahead a few decades. 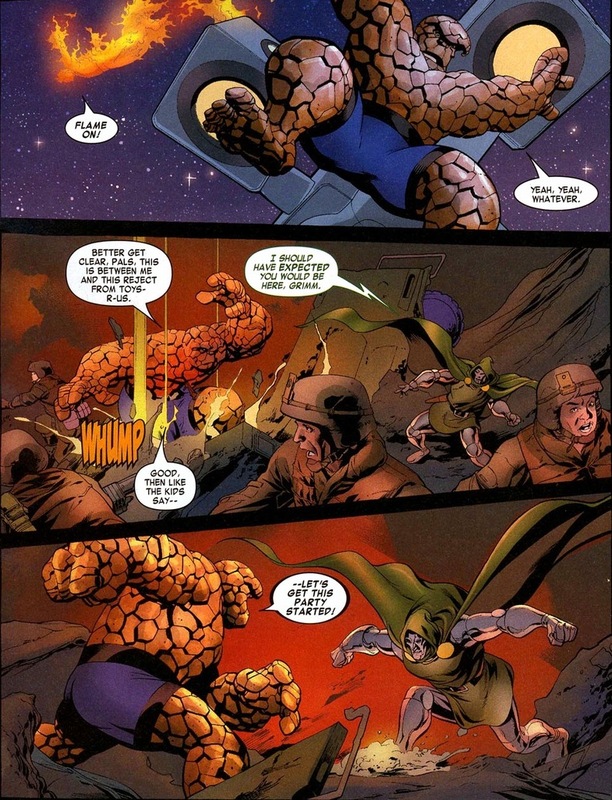 Now, instead of being the lovable trickster he first appeared to be, the character has transformed into one of the most feared and dangerous villains in the Marvel universe. 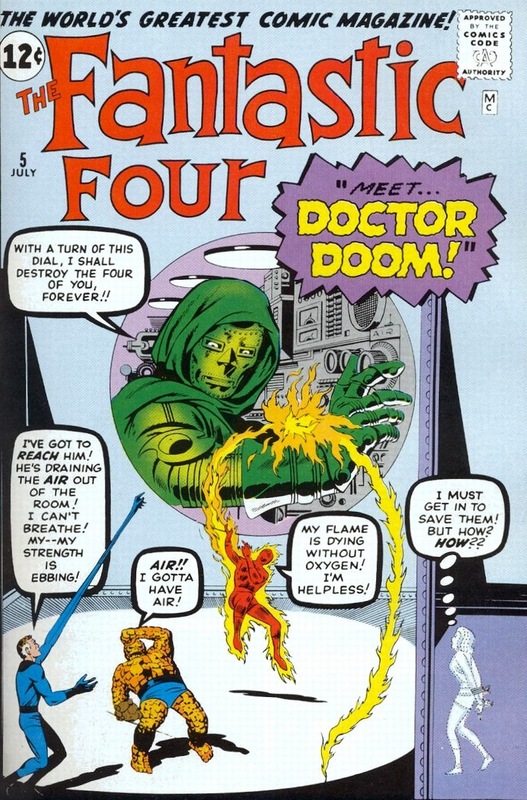 If my research is accurate, Dr. Doom has appeared in almost 2,000 issues of comics, making him the third most frequent villain in both DC and Marvel history (only behind Lex Luthor and Magneto). Nowadays he rules his own tiny Eastern European country and with politics/diplomacy how they are, it takes a lot of paperwork for him to step onto US soil. 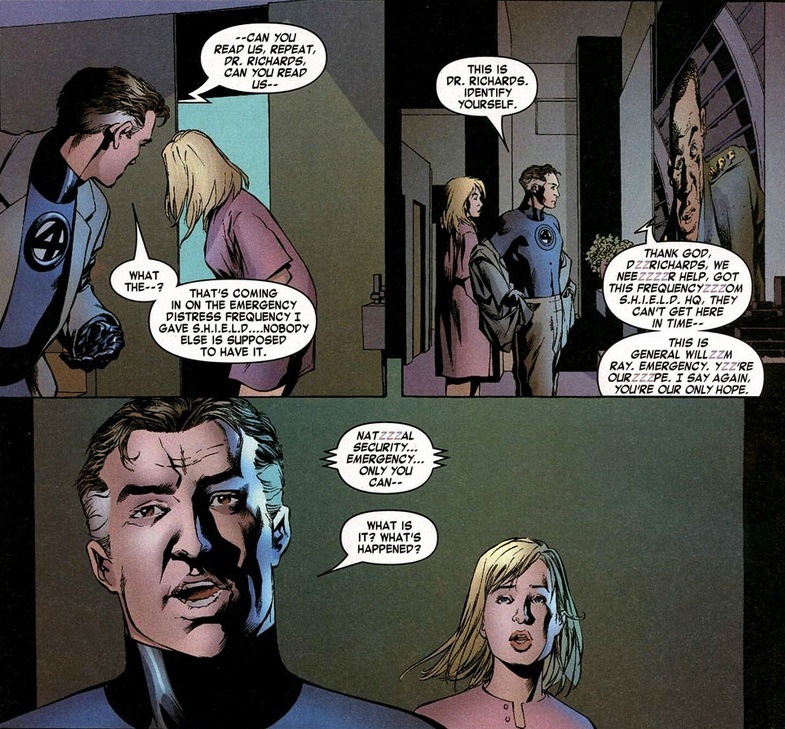 Our story picks up in Fantastic Four #536-537, written by J. Michael Straczynski and drawn by Mike McKone. 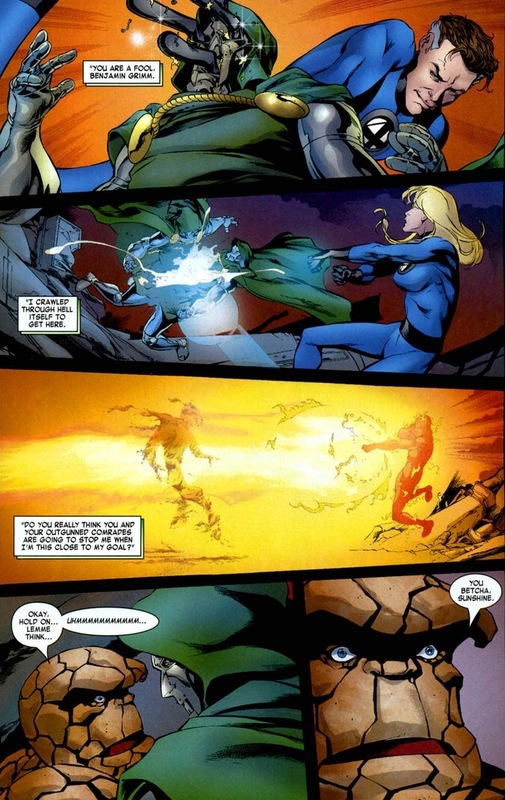 Let’s enjoy a nice, quick brawl between the top superhero family and their arch-nemesis. I’ll tell you what happened! In the middle of rural Oklahoma, something flew down from the sky and created a big ol’ crater. Remind you of movie Thor’s origin? It should. 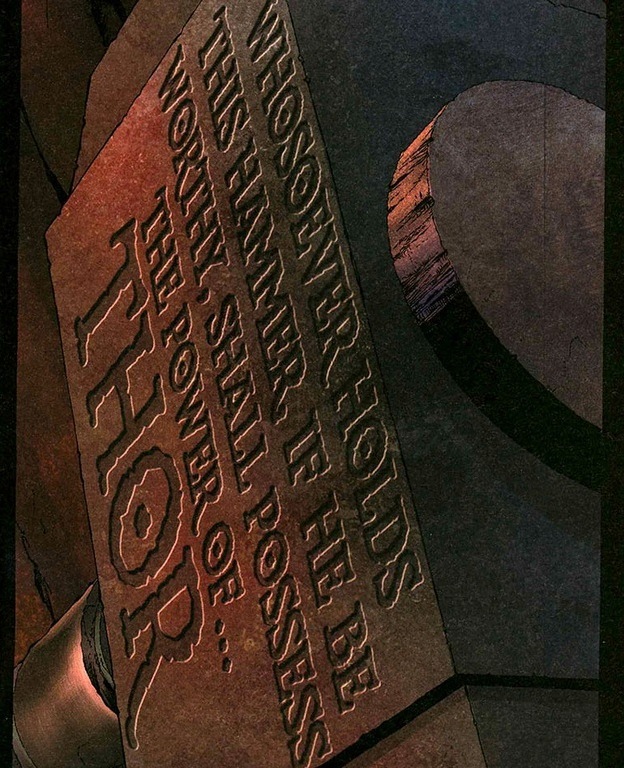 Yup, Mjolnir, the super cool hammer that gives Thor all his super cool superpowers. 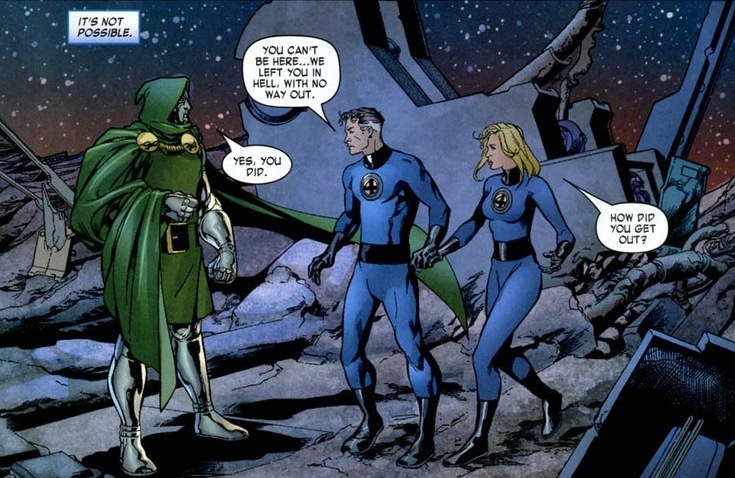 With Thor not around to claim his property, Dr. Doom swoops in, because that’s what Dr. Doom does. 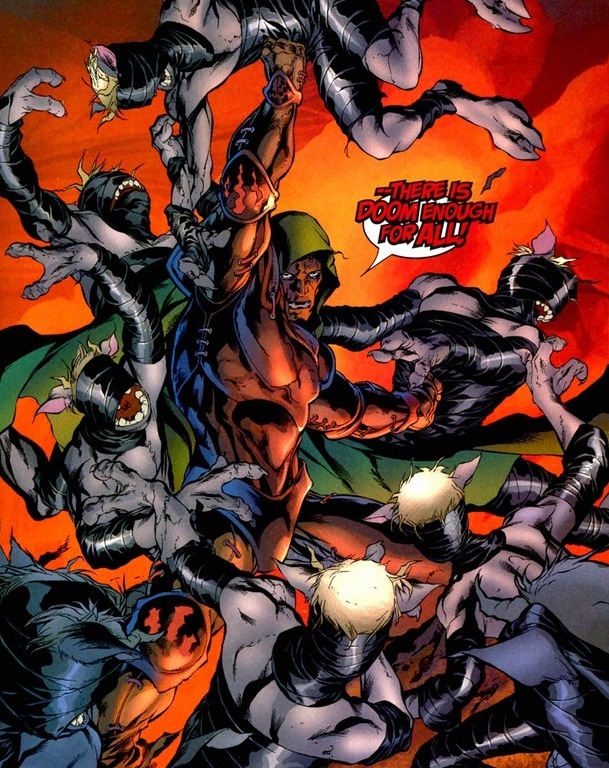 What are Doombots you ask? 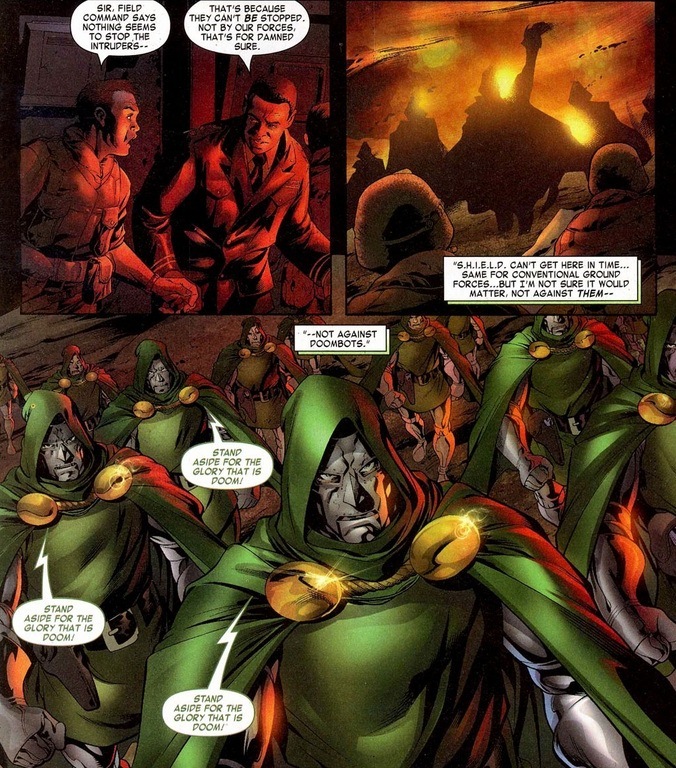 Robots that look, act, and have most of the powers of Dr. Doom. 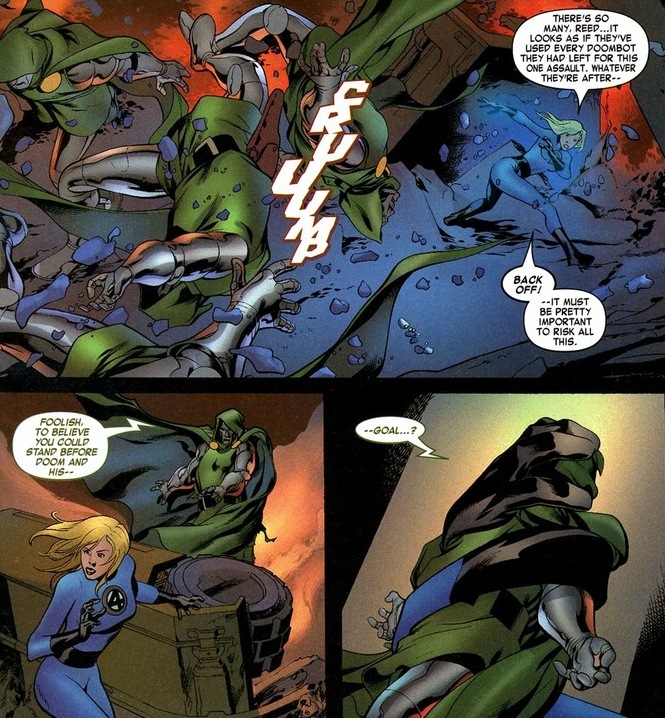 Mainly used so when the good guys take out Dr. Doom, it’s actually a Doombot and the supervillain lives to fight another day. Or, I guess, as an army. 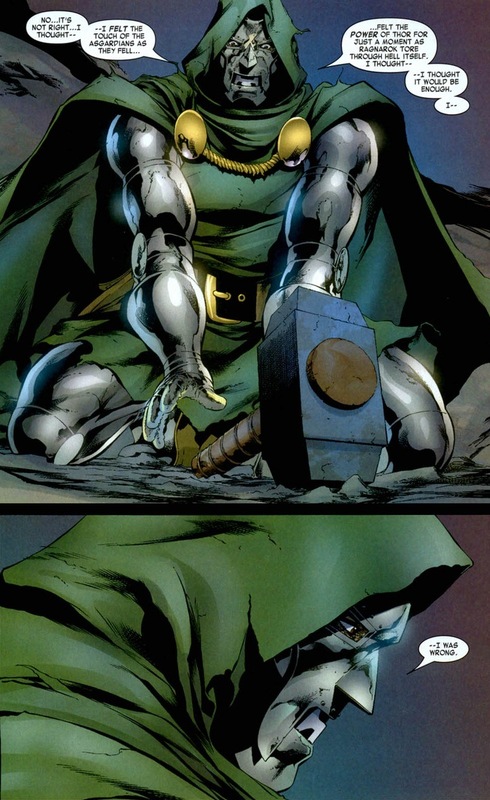 Good news for this story, though, because no Doombot could possibly lift Mjolnir, the real thing has to be there. Which one? No idea, but at least the (burned) flesh and (boiled) blood will be fighting alongside the robot lookalikes. Okay, you’re getting highlights of the fight. But surely, this’ll be enough smashing to satisfy. 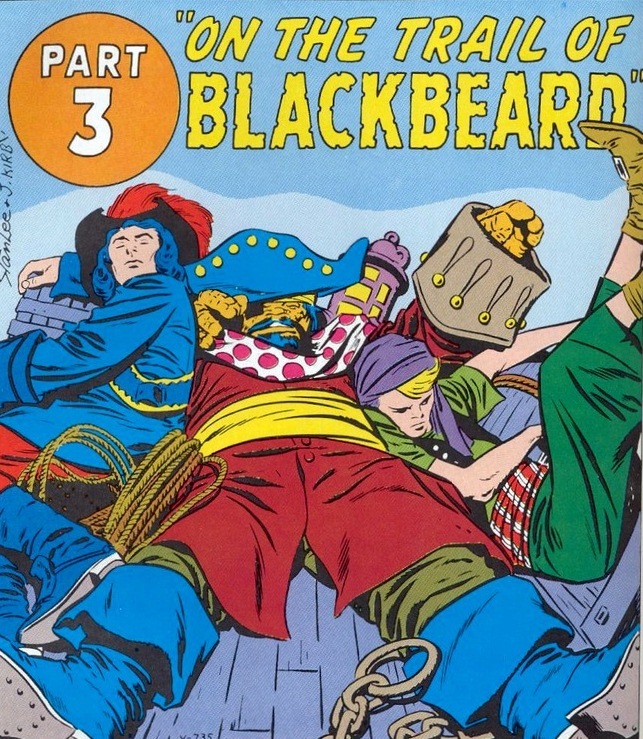 Now as politically damaging as this little escapade is for the Latverian dictator, supervillains tend not to ponder the breaking of laws and consequences of their actions. Plus, no one can really punish him. Diplomatic unity or some other stuff I don’t understand. More importantly, Mr. 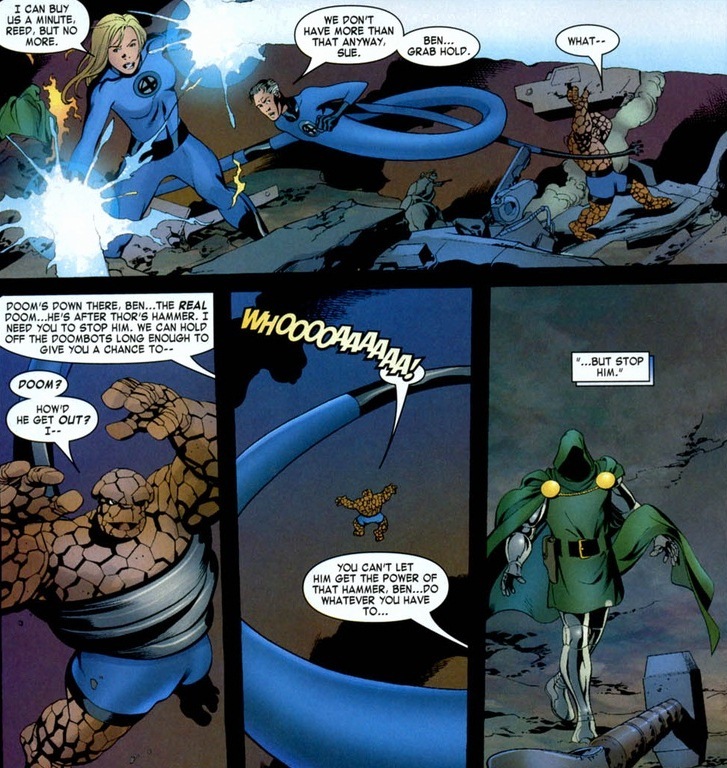 Fantastic and the Invisible Woman pose an interesting inquiry. 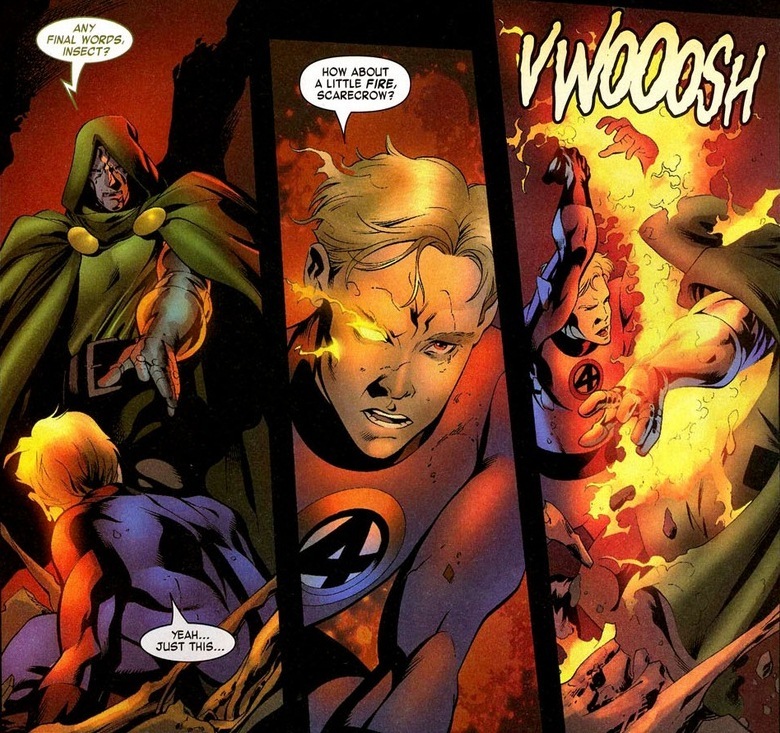 How awesome is that panel even out of context? But he did get out, and yes, it involved Mjolnir. No, I’m not going to get into it. 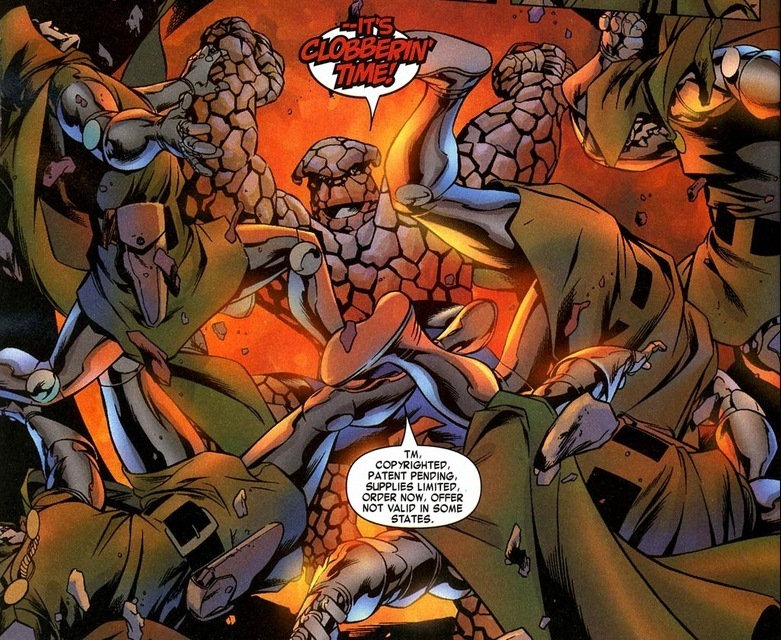 We’re here for the clobberin’. 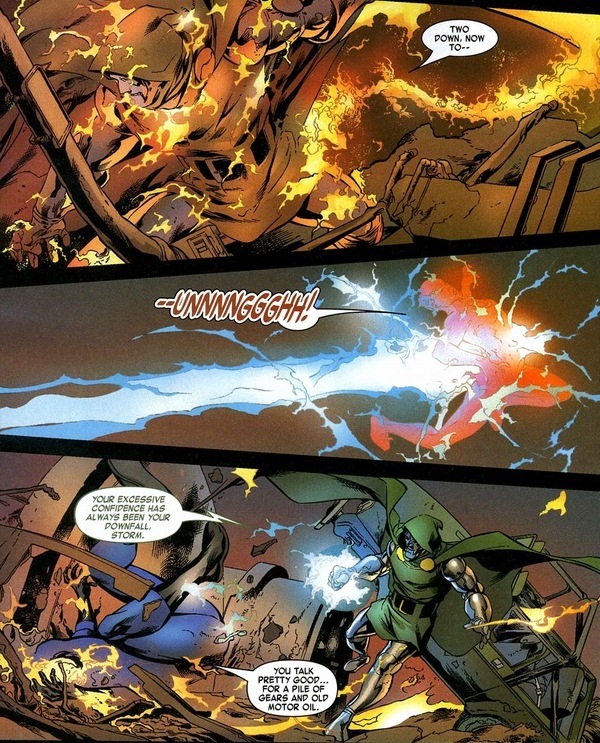 With that, Doom can giddily grab Thor’s hammer and rule the world. Y’know, except for that whole “if he be worthy” part. Oh well. The Excalibur of Marvel ain’t going to budge for the bad doctor. Now he only has an army of Doombots, mastery of the dark arts, a genius scientific mind, and the adoration of an entire nation. Hopefully that’ll tide him over until his next power play.